Belgian War Medals :Order ofthe Crown. Belgium. Instituted on the 15th of October 1897 by King Leopold II, initially as an Order of his "Congo Free State", but absorbed into the Belgian award system when the Congo became a Belgian colony in 1908. Awarded to Belgians and foreign nationals who distinguished themselves in artistic, literary and scientific work, or in industrial and commercial enterprise. The order can also be bestowed for meritorious services to Belgium or to African civilisation, rewarding both military and civilian efforts. The order has six classes, Grand Cordon, Grand Officer, Commander, Officer, Knight and the sixth, Palmes of the Order of the Crown. 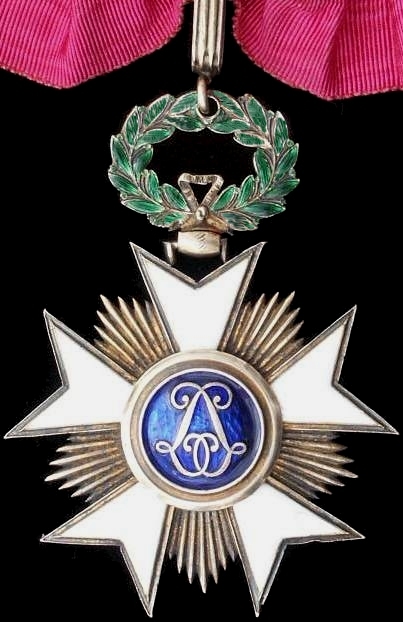 The sixth class can be awarded in gold and silver. There is also a medal attached to the order in three classes, gold, silver and bronze. The badge of the order is a five "cleft armed" star in-filled with a pentagonal pattern of intermediate rays. The blue enamel central medallion bears an image of the royal crown on the obverse side and a mirrored Leopold "L" royal monogram on the reverse side. The officers badge is in gilt with a rosette on the ribbon (illustrated) and the Knights in silver. Above : Officer's breast badge with rosette on the ribbon.